It finally rained last night. The clouds kept building up and then raining in town but not on me. Last night it rained on me and this morning I surveyed the damage. 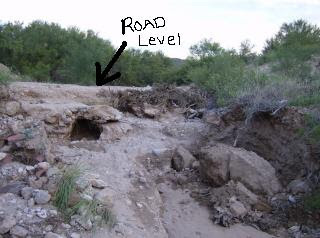 There are 3 spots where the main road is in danger of becoming impassible. This first spot is still ok for trucks but not cars. 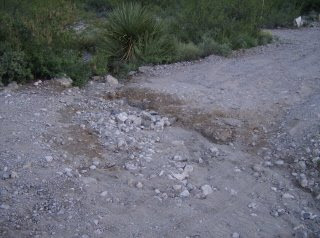 The neighbors filled it in with rocks after the last storm but this storm washed most of the rocks away. I wish I had one of those bobcat tractors. It would be fun to fill in the holes. This next spot drops off about a foot or so. It is getting closer and closer to the road. 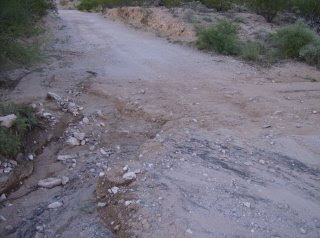 I'm not sure who maintains the roads. Somehow they magically get fixed every 6 months or so. My neighbors seem to be a bit on the hermit side. I wave to them but they aren't interested in talking. I did pay to have it graded once when I had my driveway scraped. This is the biggest problem. 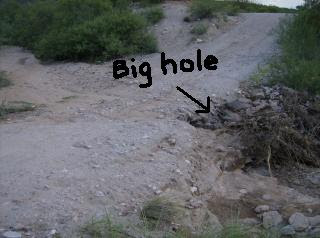 There is a large hole as you can see below. One of these mornings I will be trapped. Well, not really. There is a back way out. I bet the mysterious neighbors will fix it before it gets too bad. I'll let you know. Yes, it's bad. It doesn't rain like that very often but when it does I wonder what it will look like today. Lizzie, that is funny that you called it the moon! I sent the pictures of the animals I saw to a friend in Mexico and he said 'where do you live?...Africa???' He lives in the same Sonoran Desert region but he lives in a city. I moved to Arizona from the S. California tropics where everything is irrigated. It took me a while to get used to cactus and decorative rock yards instead of grass. But now I'm 20 minutes from town and even some of the people that I work with wouldn't live out here. Too rural and un-civilized.